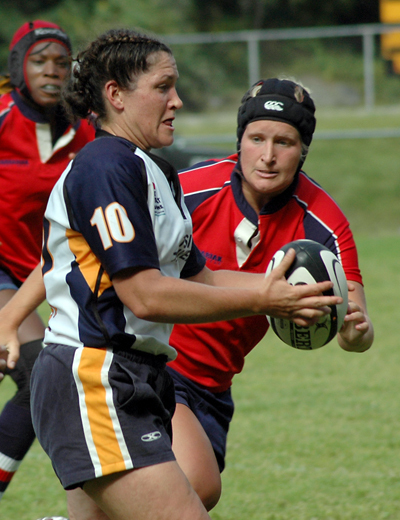 The perennial powerhouses in women's senior rugby, in recent years, have been Quebec and Ontario. Last year it was Ontario #1 and Quebec #2, in 2016 it was Quebec #1 and Ontario #2. This year Quebec defeated Ontario in a preseason match. Quebec go in as favourites to the July tournament in Saskatchewan. Now that former national women's coach Francois Ratier is the Director of Quebec Rugby there's even more reason to think they will excel. The BC team has other plans however and coach Aaron Frisby will be looking to improve on last year's 3rd place finish. They start off with matches against the Wolfpack on July 16th, and Nova Scotia on the 18th before facing the challenge of back to back games against Quebec and Ontario on the 19th and 21st. Vancouver, BC – June 19, 2018: BC Rugby is delighted to announce the 2018 Senior Women’s XVs Team. The Team will compete in the Canadian Rugby Championships, to be held in Saskatoon, SK, from July 16 to July 22. The tournament is the pinnacle of women’s XVs rugby in Canada, bringing together top talent across the country. Striking a balance between experience and exuberance, the BC team sheet boasts a wealth of recognizable names. Tyson Beukeboom, Andrea Burk, Chelsey Minter and Amanda Thornborough all boast international experience, having pulled on the maple leaf jersey for Canada at last year’s Women’s Rugby World Cup in Dublin, while a further 12 athletes return from last year’s BC Senior Women’s XVs Team. Some young, up and coming talents are added to the team with Sophie De Goede and Madison Gold both of whom are likely to be seen on National Teams in the near future. The announcement culminates an exciting and competitive Club season, with the 30 players having represented nine clubs in the BC Rugby Women's Premier League and Women's Division One, with many then stepping up for the Ruth Hellerud-Brown Cup, concluding in May with Vancouver Island Crimson Tide's fifth consecutive win over the Vancouver Wave. Head Coach Aaron Frisby announced the Team of 24 players and 6 non-travelling reserves after a weekend-long training and selection camp on Vancouver Island. “This is probably the strongest squad we have put together in the five seasons that I have been involved”, remarked Frisby, clearly targeting an improved performance at the 2018 tournament. At the 2017 competition, held in St. John, NS, British Columbia secured third place behind Équipe Québec and winners Ontario Blues. The Canadian Rugby Championships Senior Women’s tournament will take place between July 16-22 at Saskatoon Rugby Club and will see BC Senior Women facing off against Ontario Blues, Prairie Wolf Pack, Équipe Québec and Nova Scotia Keltics. For more details, visit the CRC website.